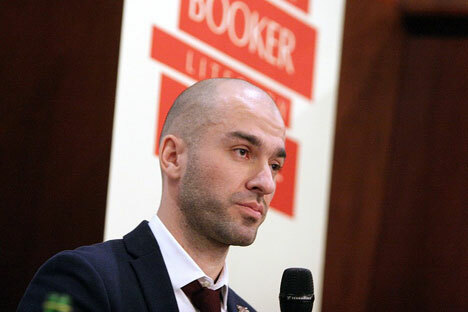 Alexander Snegirev on the award ceremony of Russian Booker prize. The Russian Booker Prize was awarded in Moscow on Dec. 3. Alexander Snegirev’s novel Vera has won the 2015 Russian Booker Prize for the best literary work in Russian. Vera is a story about a young woman of the same name who is seeking herself, wants to have children and is putting all her energy into finding love. However, it turns out that it is not very easy to achieve this goal. Alexander Snegirev was born in Moscow in 1980. In 2009 he received the Debut Award for Young Authors. His novel Petroleum Venus (2008) was nominated for a series of leading literary prizes, and his works have been translated into English, German and Swedish. Literary critic and jury member Valeria Pustovaya believes that Vera continues the tradition of great Russian epic historical novels. “It is executed in a modern way but discusses fundamental subjects,” she said. The shortlist for this year's Russian Booker Prize was Bride and Groom by Alisa Ganieva, The Lullaby by Vladimir Danikhov, Among People by Yuri Pokrovsky,Flood Zone by Roman Senchin and Zuleikha Opens Her Eyes by Guzel Yakhina. This year’s winner receives 1.5 million rubles ($22,000), while the finalists receive 150,000 rubles ($2200) each. Alisa Ganieva's novel Bride and Groom will receive a grant to fund a translation into English that will be published and distributed in the UK.